287 Augusta Avenue Map it! SHOP CLOSED Alchemy bakes a variety of round crusty breads, (including interesting novelties such as muesli, blue corn-jalapeno or apple-walnut), as well as many kinds of cookies. Alchemy also carries tarts from the Queen of Tarts and delicious pastries from Dessert Trends. See what's near Alchemy Baking. 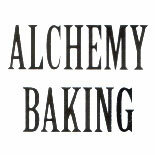 Read user reviews on Alchemy Baking. Add a comment on Alchemy Baking. Visit the official Alchemy Baking site. Sadly, Alchemy Baking (at 287 Augusta in the Market) has now closed down. We'll miss their sourdough loaves, their flavoured meringues and curry shortbreads. There's a sign in the window which says that Wanda's Pie in the Sky will be opening at that same location. I just wish Brian would make those delectable lemon squares again. The YummyBaguette website is in no way affiliated with Alchemy Baking in Toronto, but don't hesitate to let the owners know how you found them!